Nic and Joe will be performing at the Exeter Folk Project on Thursday, 24th April 14. Small number of tickets available from WeGotTickets. See respective festival websites for full details and line up. 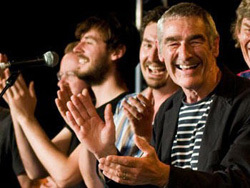 Concert on 22nd September Nic Jones and Friends at Cecil Sharp House, London. Gold Badge Award to be presented. See EFDSS website for full details of the evening. This is the final “In Search of...” tribute concert Nic will be a part of. Martin Carthy, Ashley Hutchings, Jim Moray, Pete Coe, Jackie Oates, Jim Causley, Chris Coe, Damien Barber, Tony Hall, Belinda O’Hooley, Anais Mitchell, Blair Dunlop, and Joseph Jones. 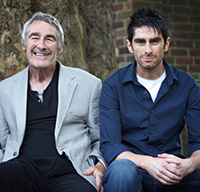 The current English folk revival owes a lot to Nic Jones. Despite a career-ending car accident nearly 30 years ago, his early recordings have inspired and influenced countless current stars of the folk scene. In this very special concert, produced in association with Sidmouth FolkWeek, some of his biggest fans pay tribute to Nic by sharing their favourites from his repertoire. The highlight of the concert is Nic himself returning to the stage for a reunion of one of his old bands, Bandoggs, and a debut with his son, Joseph. Tickets on sale now from the South Bank Centre.